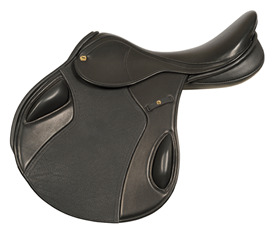 The Tra-Li has been developed with a unique system where the blocks have been placed on the outside of the saddle to provide riders with increased support.Whether competing at an international level or at your local show jumping arena, the Tra-Li offers all riders extra assistance to stay in perfect balance.Developed using a slimline tree, this exciting new saddle is one of the most up-to-the-minute models available today being both modern and highly stylish in appearance. Innovative and modern as it may be, The Tra-Li is made using vintage leather and comes right up to the mark when performance counts! Information about the new saddles carried by Palmer Equine.